Professors Desmond Ellis, Noreen Stuckless and doctoral candidate Carrie Smith bring together research and practical recommendations to help students and professionals understand the most extreme form of domestic violence. This book is the first to investigate the effects of participation in separation or divorce proceedings on femicide (murder of a female), femicide-suicide, homicide and suicide. 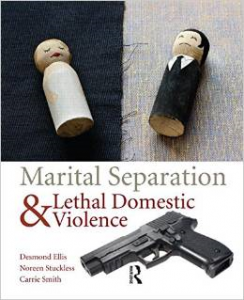 Because separation is one of the most significant predictors of domestic violence, this book is exclusively devoted to theorizing, researching, and preventing lethal domestic violence or other assaults triggered by marital separation. The authors provide evidence supporting the use of an estrangement-specific risk assessment and estrangement-focused public education to prevent murders and assaults. This information is needed not only by instructors in criminal justice and sociology programs, but by researchers theorizing about or investigating domestic violence. In the world of practitioners, family court judges, divorce mediators, family lawyers, prosecutors involved in bail hearings, shelter staff, and family counselors urgently need this resource. Ellis includes discussion questions and chapter objectives to support learners in the classroom or in community-based settings, and instructor support material will include PowerPoint lecture slides and lesson plans. This text advocates convincingly for prevention of domestic violence, and gives academics and practitioners the tools they need.